Philly.Net is proud to announce our newest Gold Level Contributor, Neudesic. Our Gold Contributors make it possible for us to host the event and provide food and drinks throughout the day. In addition, we’ve added SQL Server Magazine as our latest Swag contributor. They are graciously providing a subscription to the magazine for each attendee. You’ll have to fill out the form on the day of the event though – don’t forget! We’ve got lots of other companies supporting us. Check out the entire list. 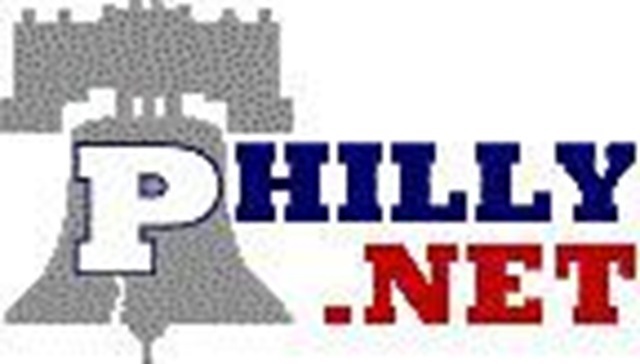 Check out the Philly.Net site for more information. And don’t forget that pub night is Wednesday, Sept 12. Code Camp Registration is Closed! Sorry, if you haven’t registered already for the Sept 15 2007 Code Camp you are out of luck. Hopefully we’ll see you at the next Code Camp, we are planning one for the winter. 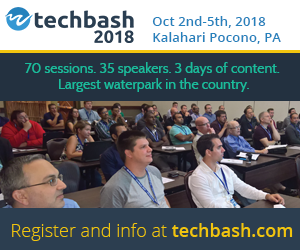 If you are attending, check out the Philly.Net site to see a list of presentations. We’ve got a nice variety of presenters and presentation topics. If you are interested in the free stuff you can get at Code Camp, check out this post. I recently started playing around with WatiN (Web Application Testing in .Net) and WatiN Test Recorder. While these are cool tools that can greatly improve the testing process, I found that there isn’t a lot of information out there to help get started. I have put together a brief tutorial on some of the basics. I hope it helps. I’m including code samples in this post, plus you can download the entire VS Solution and a short video below. WatiN, pronounced “What-in”, is a library that allows you to create tests for web applications. It is based in WatiR which was created for Ruby. Basically, you can test your web pages just like any other classes. In my case, I’ll use NUnit to control the actual tests but they are written with WatiN. The tests run in the browser via a class named “IE”. That immediately points out one of the downsides to WatiN — it only works with Internet Explorer. But the tests run in a real browser so it is very accurate. If you run that in a test, the browser will actually open, navigate to the default page, find the LinkButton and click it. Seems pretty simple right? It isn’t too complicated but you’ll have to get used to the WatiN classes and methods. The fact is, the tests are a pain to write. That’s where WatiN Test Recorder comes in. All you have to do is start the recorder and the tool will begin to record your actions in the browser (there is a browser built into WatiN Test Recorder) and translate your actions into code. If you click LinkButton1, the recorder outputs “ie.Link(Find.ById(“LinkButton1″)).Click();” for you! This is a big help but it is not exactly perfect. I have found that it doesn’t get the code right and some tweaking is needed. I’m starting to get the hang of it so the changes to the code are getting easier. Line 1 and 2 are good: Open Internet Explorer and navigate to my page. Line 3, 4, 7, and 10 are not really needed but it won’t cause any trouble. The clicks seem to be irrelevant. Line 18 is correct but worth mentioning. This selects the first row in the grid which causes the application to display the users detail in the grid. That doesn’t seem to good for a first shot! But even with all of the mistakes, I’d rather start with the generated code then nothing at all, especially if this was a longer, more complicated test. Plus, I admit there are features of the recorder that I am not familiar with so maybe it would work better if I actually knew what I was doing! The solution contains a class library with a class Tests . Using NUnit, I can execute the test easily. Tests.Tests.FirstTest : System.Threading.ThreadStateException : The CurrentThread needs to have it’s ApartmentState set to ApartmentState.STA to be able to automate Internet Explorer. There are some posts out there about resolving this issue but I have a better solution. Either install ReSharper or install UnitRun, a free tool that runs tests (also from JetBrains). While I haven’t tested UnitRun, I expect it will work the same as the ReSharper solution. Code Camp Registration is OPEN! It’s official. You can now register for Philly.Net Code Camp 2007.2. On Sept. 15, 2007 we’ll have 25 sessions on .Net related topics. Check out the web site for more information including a preliminary list of topics and presenters. Also, check out this blog post for more information on our generous corporate contributors and the prizes that we’ll have. Registration opened last night but remember, last time it filled up in less then a day! Register now, don’t get shut out. Adrian started right off by showing us a live site that demonstrates the proof of concept project that Diamond Technologies created for a client. 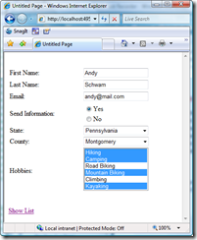 The client wanted data entry through Excel 2003, stored it in SQL Server 2005, and accessing the data through MOSS 2007. In this demo, Adrian showed some interesting techniques for using MOSS. He showed how the MOSS application creates dynamic sharepoint sites using WSS 3.0. 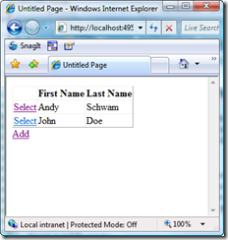 He demonstrated how to create a .aspx page that will run inside a sharepoint site. In between sessions, Bill demonstrated how he sets up the meetings on the web site. He even opened up Code Camp registration during the meeting! LINQ is a really exciting new technology. Language Integrated Query (LINQ) is a new addition to the .Net Framework. It is built in to VS2008 which is still in Beta. Kevin suggests running it in a virtual machine only! He showed 4 of the key types of LINQ: LINQ to SQL, LINQ to XML, LINQ to DataSets and LINQ to Objects. 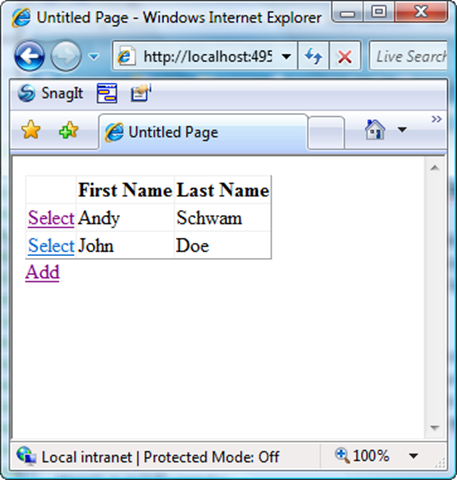 LINQ to SQL allows a programmer to write .Net code in a strongly typed manner and access data in a SQL db. He used sqlmetal (a cmd line tool) to create objects for him. It is similar to a strongly typed dataset but it is a class. The syntax is similar to SQL but still quite different. LINQ to Objects is really cool. 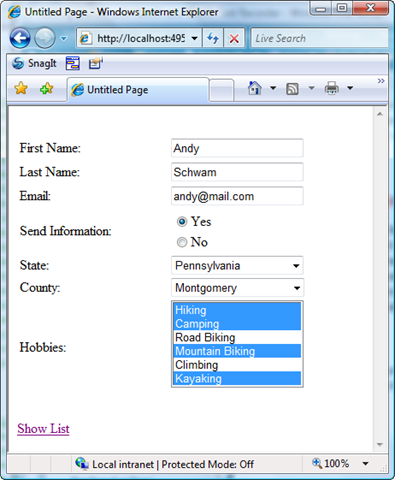 It allows you to execute “sql like” queries on collections of objects. Kevin also showed how you can take a LINQ result and load it into a DataSet using reflection. Since Kevin was running a little late, there wasn’t much time to show LINQ to DataSets and XML but he did a quick run through on the basics. LINQ is pretty cool stuff. We’ll all be using it soon so it is a good idea to start reading up. Hopefully I’ll have Kevin’s source code to post soon. Check out his blog for all sorts of information. Meeting Sponsor: Diamond Technologies… Thanks for the sandwiches and snacks!